Most often babies are being sent home from the hospital or birthing center without being given a bath. This puts new parents on the alert: Are baths bad for newborns? As always, you can find experts on every side to this issue. There are those saying even plain water will dry your baby’s skin out…….come on!!! At birth your baby is growing at an incredible rate. Everything is growing and regenerating, especially skin. Some studies say as adults our skin regenerates every seven days. For a newborn it is way faster than that. If properly fed, nourished, and hydrated very little can dry out you baby’s skin. You may notice flaky skin. Most likely this is just old skin falling off to make way for the new. Simply water should not make any difference in a normal situation. If the flakey skin persists be sure to call you pediatrician. It never hurts to ask….. There are situations where this is different. Example: Cradle Cap. Cradle Cap is the evidence of old skin falling off and unable to disappear because it is in the hair field. Thus, one can see discoloration on a baby’s head. Simply brushing baby’s hair daily (with a very soft brush) will avoid this condition. There are many ways to alleviate this problem. Wet your baby’s head and gently comb their hair with either a soft brush or a special plastic utensil made for this process (shown below). This will loosen the dead skin and remove it. You can use either coconut oil, Aquaphor, or even olive oil for this purpose. Use a very minimal amount as you do not want oily residue on you baby’s head. I always recommend the simplest option, I would use water. Be gentle. It may take a few treatments to remove the old skin. Do this once every day or two as baby’s skin is sensitive and thin and you do not what to irritate it. Back to baths…………Pediatricians often do not tell parents when regular baths for baby should begin. I worked with a two month old baby who was still receiving baths every third day. Daddy said his baby smelled bad. This is because baby was gaining weight and breastmilk dripped into the rolls on his neck. Bathing every third day did not clean him up enough to avoid the smell. YOUR BABY SHOULD NEVER SMELL BAD WHEN CLEAN!!!!!!! Simply a sponge bath daily will resolve this. You can use very mild baby soaps if you wish, I would just use water. Bathe your baby daily if you are comfortable with this. Definitely bathe baby after a poop or feeding disaster. I recommend bathing baby after you have been out of the house. If baby has come in contact with others and or children it is wise to clean her up when you get home. When the weather is very humid or warm wiping baby down with a cloth and changing clothing gives comfort. My grandson spent weekends with us as a very young age. I had a large plastic bowl I would put in my kitchen sink. I filled it with warm (not hot) water and bathed him there. It put him at a great height for my back! Important for you to be comfortable while bathing! I set out a large bath towel on the counter to wrap him in after bath time. This worked beautifully until he was walking. SIMPLICITY IS THE BEST OPTION. There are many baby bath tubs you can purchase. But then you have to store them and clean them. Initially your newborn is very difficult to hold on to. They are like spaghetti, trying to move them in and out of a bathtub is scary! Arrange a bathing system with which you are comfortable. FOR THE FIRST FEW WEEKS: simply lay a thick soft towel next to your kitchen sink. Lay baby on the towel. Remove clothing and diaper. Use a soft washcloth wet with warm water and wipe baby down. Wipe her face, neck, and head. Then move onto the wrinkles in her neck, her chest, and legs. Roll her over with one hand and wipe with the other to clean her back. Wash her bottom front and back last then disagard your washcloth, If it is cold where you live, undress the top half of baby, wipe down, replace the shirt and then begin on the lower half. I recommend having another adult or mature child with you the first few times you do this. The moral support will make it easier. Once you are comfortable bathing baby move to the kitchen sink technique. Put warm water in the bottom of a large plastic bowl. I chose plastic because it gives and it does not get cold. Be sure you can hold onto baby with comfort. If you are afraid you will drop her wait a few weeks. Try again. Use water alone unless you feel you need a very mild soap. When finished wiping baby down with a wash cloth move her to the towel beside the sink. Dry her, dress her, don’t forget the diaper, then comb her hair. She will be clean and sweet smelling!! Rah! Veteran mom’s have baby bathing down pat. Soon you will too!!!!! descriptionSoft and pliable to gently treat Cradle Cap! Original Sprout created their own. 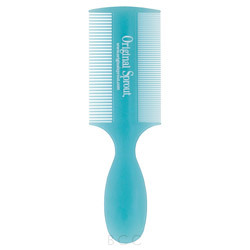 Soft and pliable design makes our deluxe cradle cap comb superior to the usual hard, variety. We pride ourselves in offering only the finest for all Little Sprouts. How Can Coconut Oil Benefit My Baby? Often I am asked how to treat dry skin or cradle cap in newborns. There are, of course, many ways, but my favorite choice is coconut oil. It is natural, benefits many different situations, and these days most of us have it on hand. Coconut oil is mild and it smells good. As always, moderation is the best plan. I keep my coconut oil in the refrigerator. Thus, it is solid. This makes it easy to control how much I use. 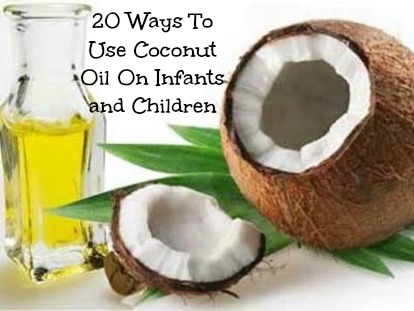 I tell parents, rub your finger on the block of coconut oil and then on the dry skin area on your infant. The amount of coconut oil that actually makes it to your baby is minimal. Wait a few hours and see how your baby’s skin is affected before using more. If all is well try it again. If the area is red or the dryness worsens try something else. Below is an article discussing 20 different ways to use coconut oil. When trying new items with your infant try them one a time. Wait a day or two to see how your baby reacts. When introducing anything new to your baby you want to do it one item at a time. This is true with foods, cleaning products, baby soaps or lotions, etc. If you introduce items one at a time and there is a negative reaction you know immediately what caused it. If you provide numerous new things all at once and there is a problem you have to go back and try them one at a time to discover the problem. Wow! The year is already racing by! Now that you have little ones to consider, time seems like it is moving so fast it is almost impossible to do anything but watch! How does one accomplish anything besides diaper changes, laundry, breastfeeding, and sleeping? First of all, it is important to remember your priorities have to change! This is a wonderful, crazy, and exhausting time of life. Enjoy it as much as possible. Your babies are only small for a short time. You do not want to miss these precious moments because you were focusing on having the cleanest house on the block. I am not saying you live in a dump, but you have the rest of you life to work on an immaculate house. Now is the time to enjoy your babies. If you can afford it financially, have someone else do the housecleaning for a time. If not, when someone asks you what you want for you birthday tell them ‘a house cleaner for a day’! Investigate healthy prepared meals so you do not have to spend more time in the kitchen that you wish. I love to cook, but with babies-in-tow planning, shopping, and cooking were simple more than I could arrange. Meals like pre-made baked lasagna, ravioli, or fish-sticks and a salad became our coup de grat. My kids got to like boxed mac n cheese so much that later on when I began baking the good stuff they preferred boxed! Ouch! You do what you gotta do! I found a local church that provided a ‘Mom’s Morning Off’ once a week for a low fee. I would keep my errands to a minimum through out the week with the kids, and pack everything possible into the three hours I enjoyed for ‘Mom’s Morning Off’. It took so much pressure off my schedule. Maybe you have a relative who wants to help out. Let them take the older kids to the park while you and your newborn rest together. I participated in a babysitting co-op. This allowed my friends and I to share babysitting for the times I could not include the kids. There are a million ways to work out a little extra time for projects or events. Be creative! You can make it happen! !